Lately, we witnessed how a kid answered equations involving a square root who answered instantly without using a calculator or any medium. The kid was able to determine whether the square root of a number has a value or simply an imaginary number. And you think it’s over? Well, think twice since here are two kids who are also math wizards with their skills in solving square roots with their minds. What’s interesting is that they are friends with the first math wizard kid that we have introduced to you. The two kids were begging on the street for coins in exchange for their mathematical skills. Because of the popularity of the video of the first kid, ABS-CBN came to visit the place where the kid lives and it’s surprising to know that he is not alone with the kind of knowledge he possess for there are two other kids who can do what he was doing. The names of the two kids are Joel and Archie. ABS-CBN tested their skills using a calculator to know if they can also do what the first kid was doing and the reporter from ABS-CBN was amazed. The kids then went to what they were usually doing which was their lifestyle or their ways of making money by begging. The two went closer to a group of students wherein they answered mathematical equations and the students were amazed. When the kids were asked about how they acquired such skill in solving math problems, they answered that by way of begging that they happened to meet a group of civil engineering students whom they didn't know. Because of the skills of the kids in solving mathematical equations, ABS-CBN gave support to them so that they will be given enough education. 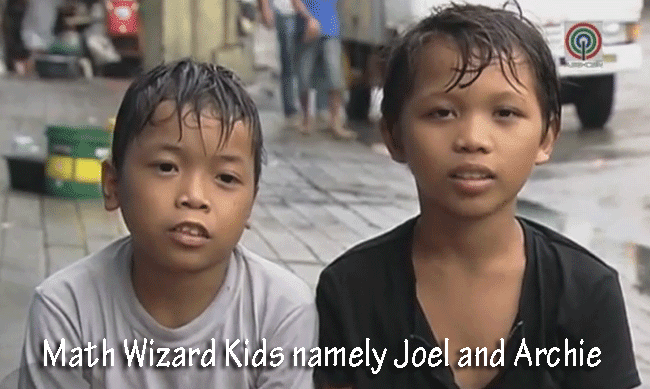 What if these Manila Math Wizard Street Kids studied on Classical Mental Arithmetic?